(Rachel Bloom is) never anything short of electrifying; manic when she needs to be, subtle when she needs to be and filling every song with a full-beam, show-pony, stage-school commitment that isn't often seen on TV. Why See Crazy Ex Girlfriend Live? Combining satirical comedy with unapologetic melodrama, Bloom and her co-creator Aline Brosh McKenna struck comedy gold in the form of Rebecca Bunch and her lovelorn antics. After a chance encounter with her first love Josh from Summer camp, Bunch swaps her high-flying New York City job at a law firm for the pastoral climes of West Covina, California, in search of a happy ending with Josh. Whilst side-achingly funny, the show also tackles topics like mental-health, female sexuality and parenting in its plot lines and genre-pastiche songs, making it more than just another romantic comedy. Sound good to you? Share this page on social media and let your friends know about Crazy Ex Girlfriend Live at Radio City Music Hall. 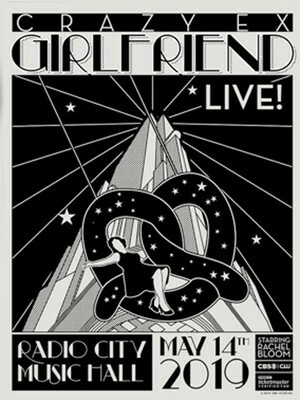 Please note: The term Radio City Music Hall and/or Crazy Ex Girlfriend Live as well as all associated graphics, logos, and/or other trademarks, tradenames or copyrights are the property of the Radio City Music Hall and/or Crazy Ex Girlfriend Live and are used herein for factual descriptive purposes only. We are in no way associated with or authorized by the Radio City Music Hall and/or Crazy Ex Girlfriend Live and neither that entity nor any of its affiliates have licensed or endorsed us to sell tickets, goods and or services in conjunction with their events.